* If overnight flight, you will overnight onboard and arrive on Day2. After Breakfast, free at leisure. Own transfer to Circular Quay jetty for check in Harbour Cruise, departure daily 1430hrs. 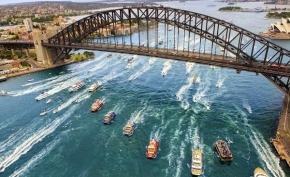 See all the harbours best-known landmarks. Cruises are fully narrated and also stop at Darling Harbour for a visit to Sydney Aquarium (Sydney Aquarium entry is at own expense). After Breakfast, pick up at Rydges World Square Sydney Hotel for tour.Discover the spectacular Blue Mountains and see native wildlife whilst you explore World Heritage-listed Blue Mountains National Park. This rugged and beautiful region forms part of the Great Dividing Range, linking tropical north to temperate south, while dividing coastal cities from the vast Outback. Pass by Homebush Bay, site of the 2000 Olympics. Enjoy a stop at Echo Point and see the famous Three Sisters rock formation and have an opportunity to visit the Koomurri Centre and hear the ancient Aboriginal legends of this impressive rock formation. Arrive at Scenic World and join the optional Blue Mountain rides - Scenic Railway, Cableway or Skyway (own expense). These rides are a great way to see the steep valleys, canyons and Three Sisters rock formation. Discover Leura village where you will have free time for lunch or the chance to wander the streets. Next we enjoy an afternoon encounter at Featherdale Park and have your photo taken with a cuddly koala, see kangaroos, wombats, dingoes and cute little fairy penguins. The last stop will be at Homebush Bay, the venue of the Sydney 2000 Olympic Games. The coach will arrive in Sydney at approximately 5.45pm. Hotel drop offs to most city hotels are available; your Coach Captain will ask you at the end of the day where you would like to be dropped off. After Breakfast, pick up at your stay hotel for tour.Relax, get away from the city, and enjoy some fabulous food and wine in Australia's oldest wine-growing region. Just 2 hours north of Sydney, the Hunter Valley combines world-renowned wines, gourmet produce and stunning countryside - all the makings for a great, relaxing day. With over 90 Cellar Doors in the Hunter, we focus on the boutique wineries, where the passion of the wine-makers is obvious. With your small group of no more than 14 travellers, our flexible itinerary gives you access to a range of excellent wineries, meeting the people who make and grow the wine. We also enjoy a behind-the scenes tour at one of our favourite boutique wineries. A fabulous day out of the Sydney enjoying the delights of Australian produce. Transfer to the airport via sharing vehicle for your flight back home.